Top: Freddie Johnson and Dr. Pearse Lyons; Bottom: Max L. Shapira and Matthew J. Shattock. 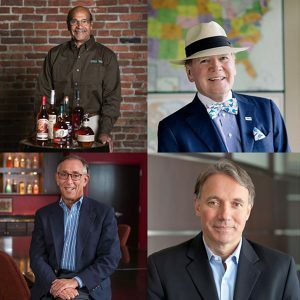 LOUISVILLE, Ky. – The Kentucky Bourbon Hall of Fame will induct three individuals into its hallowed ranks on Friday, Sept. 14, and bestow its prestigious Parker Beam Lifetime Achievement Award on one of the industry’s most successful leaders, visionaries and champions. The late Dr. Pearse Lyons, founder and president, Alltech, Inc.
A limited number of tickets are still available at www.kybourbonfestival.com for the luncheon event on Friday from 11:30 a.m. to 1:30 p.m. at the Frazier History Museum on historic Whiskey Row in downtown Louisville, 829 West Main Street. Tickets are $100 and include lunch and drinks. 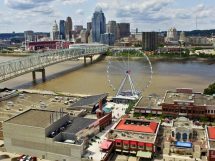 The 27th annual Kentucky Bourbon Festival, which runs September 12 -16 this year, is a celebration of all things Bourbon. Tickets to select events are still available at www.kybourbonfestival.com.